This entry was posted in Vacuum Tubes and tagged 12au7/ECC82, Westinghouse by jsch123. Bookmark the permalink. Received a matched quad of the Westinghouse 12au7 JAN-CWL Carbon Plates from the 50’s. I’ve been listening to the standard version of these, so it’s been easy to do a comparison. These are the “higher grade” military version and cost me 5x the price of the regular 337’s. Surprisingly, they’re not nearly enjoyable. They bring more volume and sound clear, but don’t have the deep soundstage or ‘musicality’ of the standard version. They sound fine, but nothing too special. I have a very similar experience with this tube. 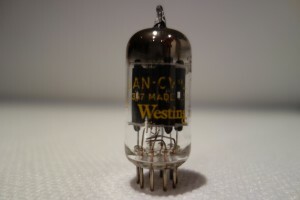 Although I was looking forward to that tube after experiencing regular Westinghouse 12au7, but was a bit disappointed. The lusciousness was diminished significantly and creaminess/velvety sound of the civil version was practically gone. Still a great tube, but just not the best.